As computers and the desktop metaphor reach virtual ubiquity in our daily lives, they also become objects we take for granted in daily use. The Desktop Subversibles application suite exploits this ubiquity by focusing on standard desktop activities like copy/paste, mouse movements, and clicks by adding networked and physical outputs to highlight these mundane activities' collective and collaborative potential. Desktop Subversibles capitalizes on the ubiquity of our interactions with computer desktops to convey awareness of activity and a sense of shared network space among the members of an online and physical community. Share your clipboard with the world. Screen miles to real miles. Share your mouse across distance. Connecting clicks across the globe. ClipIt! is a networked application that provides an ambient connection to other people's desktops by distributing the contents of each users clipboard. The project works as an automatic Post-It or sticky note that is meant to allow people to catch a glimpse of the cut and paste activity on other people's machines. Copy and paste are ubiquitous elements of the modern computer GUI interface. They are both infinitely useful for working with computers and are integral elements to all computers across all platforms. Our use of these functions is so natural that we even forget we use them and without them our methods of computer interaction would change dramatically. More Info on ClipIt!. 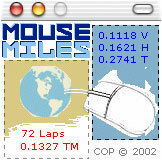 . . MouseMiles is a networked mileage indicator for your mouse. Over time it calculates the mileage traveled by every connected mouse and relays that information to a central server. The server collects all of the incoming mileage and outputs the distance in real-time to move a physical object - currently a model train around a track. The idea behind MouseMiles centers around our connection to familiar objects (in this case a mouse) and how we share this connection and use with others across distance. The mouse is a fundamental input device to the modern computer. Despite our miniscule movements while using it, over time these movements measure up to long distances without us even noticing. Current connections between people separated by distance take place during time specific intervals - i.e. when you have time to write that email, call the other person, send them a letter in the mail, or send them an Instant Message. Instant Messengers (ICQ, AIM, MSN Messenger) are perhaps the closest thing we have to a constant connection since when both people are logged in each is instantly aware of the other person's presence, activity (away, busy, available), and personal information. Still, the method of communication between people connected to IMs requires foreground activity such as opening a window, typing a message, and clicking the send or return buttons. Instead of relying on this type of foreground connection, MouseTraces keeps track of each person's desktop activity in an ambient, non-intrusive way. More Info on MouseTraces. . . Clicks is a networked application that collects mouse clicks made by each person connected. Once collected, clicks are sent to a central server and each connected client is assigned a unique tone which is played in a physical location (currently installed at MLE), creating an ambient sound installation as an indicator of computer activity and use on a global scale. Clicks_LiveMixer allows people to "hear" the incoming clicks and mix the sounds by changing pitch, tone, and duration of each note associated with the incoming clicks. Version 1.5 allows for drag and drop of users into specific pitch and tone coordinates that assigns unique notes for each person connected. Mouse clicks are ubiquitous elements of the modern computer GUI interface. A mouse still exists as the key device we communicate and interact with elements on screen. Our use of the mouse is so natural that we even forget we use it and without it our methods of computer interaction would change dramatically. Clicks centers on this background activity of clicking. Specifically, it looks at everyday computer activities and how when shared, these actions take on new meaning. From providing a window into computer usage in local communities (such as offices, homes, schools, or events) to global use as distributed over the Internet, Clicks allows an ambient link between computer users within the desktop sphere. When multiple users are connected, their click total is added to the collected total and distributed to everyone connected. More Info on Clicks. . .
Jonah Brucker-Cohen is an artist and Research Fellow in the Human Connectedness Group at Media Lab Europe in Dublin, Ireland. He received a Masters from the Interactive Telecommunications Program at New York University's Tisch School of the Arts, NYC and worked there from 1999 to 2001 as an Interval Research Fellow creating interactive networked projects. His focus is on subverting existing relationships to human/networked interfaces by building new real-world inputs to networks, redefining how information is used and experienced, and shifting virtual processes into physical forms through networked devices and experiences.